If you are not at Minifest, and do not make EVERY, SINGLE, POSSIBLE EFFORT to meet and learn with Jango Edwards at the Brick Theater in NY next week then you will have missed one of the absolutely greatest clown teaching experiences in the world, bar none. The hype is all true. The man is a pure comedy genius. If this is the intensive, The Nouveau Clown Institute will be turning out incredible clowns! 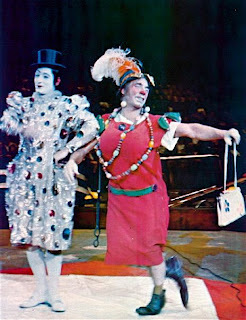 Jonathan "Mitch" Freddes, continuing a long clowning legacy, performing with Kinko Sunberry's barrel (given to him at Clown College by Lou Jacobs in 1974) at the Lou Jacobs Tribute held by Circus Sarasota in 2000. He is introduced here by the one and only Mr. Todd Robbins. Here’s something the great Art Babbitt uttered in 1941. One could say the exact same thing about today’s mainstream animation, and sadly, it would all still apply. America's cartoon animators and circus clowns have far more in common than either group would seem to admit. 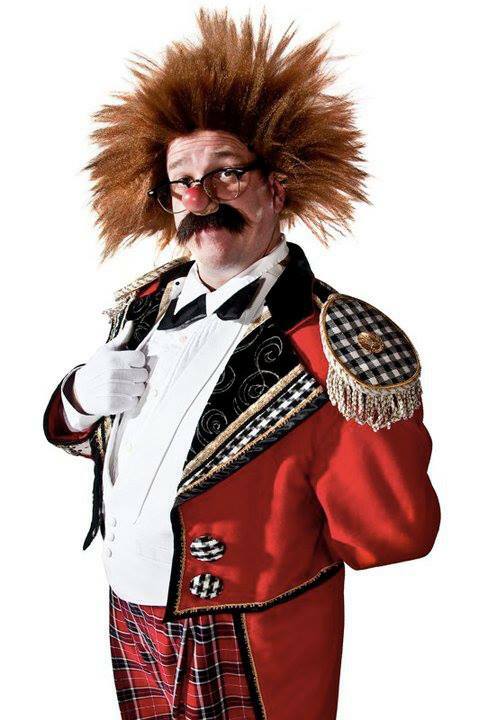 I received a lovely message recently from Herr Pic, a very thoughtful man and a wonderful clown. The performer appeared on many other TV shows, in movies and in Las Vegas. Carl Ballantine, the "amazing" comedy-magician and character actor who was part of the World War II PT boat crew on the 1960s sitcom "McHale's Navy," has died. He was 92. Ballantine died in his sleep of age-related causes Tuesday at his home in the Hollywood Hills, said his daughter Saratoga Ballantine. As an actor, Ballantine was best known for playing the supporting role of crew member Lester Gruber on "McHale's Navy," the popular 1962-66 series that starred Ernest Borgnine. "He was a natural; everything to him had humor," said Tim Conway, who played the bumbling Ensign Parker on the show, where he first met Ballantine. "I only knew him from seeing him on 'The Ed Sullivan Show,' which I thought was the funniest thing I ever saw, the magic act that wasn't working," he said. Indeed, it's as a comically inept magician variously billed as "The Amazing Ballantine," "The Great Ballantine" and "Ballantine: The World's Greatest Magician" that he made his biggest impact as a performer. In 2007, Steve Martin presented Ballantine with the Lifetime Achievement Fellowship from the Magic Castle in Hollywood. "Carl Ballantine influenced not only myself but a generation of magicians and comedians," Martin said Wednesday in a statement to The Times. "His was also the most copied act by a host of amateurs and professionals." Magician David Copperfield is another longtime fan. "Basically, Carl Ballantine created comedy magic," he said. "The combination of magic and comedy had perhaps been done before, but he truly defined it and made it his own." Beginning in nightclubs in the early 1940s, the tall and lanky Chicago native would walk out on stage in top hat, white tie and tails. "If the act dies, I'm dressed for it," he'd tell his audience, and he was off and running with a satirical magic act that conjured up laughs rather than amazing feats of sleight of hand. At one point in his act, he'd tear a newspaper page into strips, boldly claiming that he would restore the paper to its original state. Then he'd stop to read the want ads. Ballantine performed at the legendary Palace Theatre in New York and in Las Vegas in the 1940s. He later took his act to television, appearing on a host of programs, including the Garry Moore, Andy Williams, Danny Kaye and Dean Martin shows, as well as "The Hollywood Palace" and "The Tonight Show." Born Meyer Kessler in Chicago on Sept. 27, 1917, Ballantine learned his first magic tricks from his barber at age 9. He was performing straight magic with poker chips, playing cards and money in an act called the River Gambler in 1940 when he underwent a career reassessment. "The act wasn't successful in nightclubs," he told Hyla M. Clark, author of the 1976 book "The World's Greatest Magic." "I had to make a living, so I looked at myself in the mirror and said, 'You don't look much like a magician.' Then I put this other thing together." The other thing, Clark wrote, "soon became one of the most successful of contemporary magic acts." Exempt from military service during World War II because of back trouble, Ballantine entertained the troops in England. He performed his act for the last time at the "It's Magic" show at the Kodak Theatre in Hollywood last fall, his daughter said. "To great acclaim, I might add. His timing was still fantastic," she said. Ballantine appeared in a number of films, including "The Shakiest Gun in the West" (1968), "The World's Greatest Lover" (1977) and "Mr. Saturday Night" (1992). He was a regular cast member on the 1969 sitcom "The Queen and I" and the 1980 sitcom "One in a Million." And he made guest appearances on numerous other series, sometimes appearing as a magician; he showed up on "Fantasy Island" as the Great Zachariah, on "Night Court" as the Fabulous Falconi and on “The Cosby Show” as the Great Ballantine. He also did occasional cartoon voice-overs and hundreds of voice-overs for commercials, including one for the California Raisins in which he voiced the Raisins' talent agent, a Claymation character that resembled him. Ballantine's wife of 45 years, actress Ceil Cabot, died in 2000. In addition to his daughter Saratoga, he is survived by another daughter, Molly; and his sister, Esther Robinson. Instead of flowers, the family requests donations be made to Used Pets, 517 W. Buckthorn, Inglewood, CA 90301. No funeral will be held. "He wanted to have his ashes scattered over Santa Anita racetrack," said Saratoga Ballantine, who was named after the racetrack in New York; her sister Molly's middle name is Caliente, after the track in Tijuana. "He loved the ponies," she said. To view Bernard Guillaume-Gentil's 24 minute television interview with Charlie Rivel, please click the title of this post. Charlie Chaplin and Buster Keaton from the film Limelight. Franco Franchi & Ciccio Ingrassia. No cheating. Show your work. 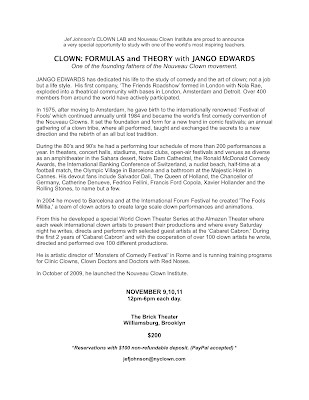 JANGO EDWARDS: Clown Lab in NYC Nov 9, 10, 11!!! Please click the jpg to enlarge it! Jango is currently in Reistertown, MD teaching at Minifest (where reports are that attendees are having the time of their lives!) and these classes in NY are an EXTREMELY rare opportunity to learn from Jango here in the States. For more information on Jango's latest project, the Noveau Clown Institute, please scan down and click the link for it in the right hand column. Carl Ballantine (born 27 September 1922 in Chicago, Illinois, died 3 November 2009) — birthname Meyer Kessler — was an American actor, magician and comedian. 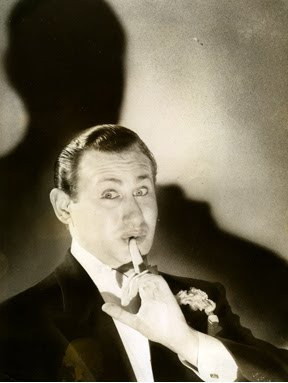 Billing himself as "Ballantine the Great" or "The Amazing Ballantine," his vaudeville-style comedy routine involved transparent or incompetent stage magic tricks, which tend to flop to the wisecracking Ballantine's mock chagrin. 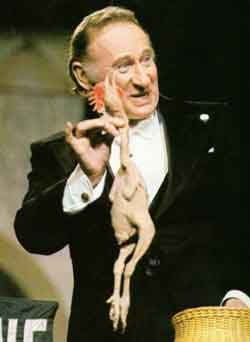 In his early career, Kessler did a straight manipulation act but gave up "real magic" when he realized he could not be as good as some of his peers. He changed his name to Ballantine early on after he noticed a bottle of Ballantine whisky in an advertisement and decided that the name of his magic act was to be "Ballantine, the World's Greatest Magician". He proved successful enough that he became the first magician to headline in Las Vegas. Ballantine is probably best remembered as Lester Gruber, one of the PT boat sailors in the television series McHale's Navy (1962-66). He appeared as Lycus the slave merchant, on Broadway in the 1972 revival of A Funny Thing Happened on the Way to the Forum starring Phil Silvers. His most recent film appearance was in Aimee Semple McPherson, a 2006 biopic about the notorious female evangelist. Ballantine was the husband of actress Ceil Cabot (8 March 1927, USA - 24 January 2000) and is the father of actress Sara Ballantine. He is known as an inveterate smoker of Cuban stogies. 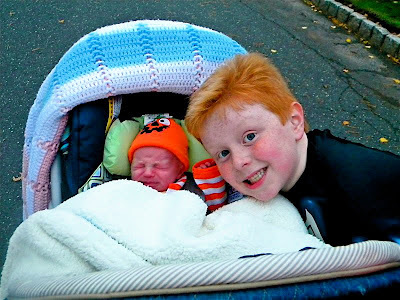 He enjoyed it far more than Halloween, despite his brother Shane's enthusiasm. Last night James watched his first Three Stooges short (Violent Is the Word For Curly) , his first Gumby (Small Planets), his first Popeye (Lil Swee' Pea) and his first Keaton short (Haunted House, a repeat at Shane's request). James seemed largely unimpressed with the program. 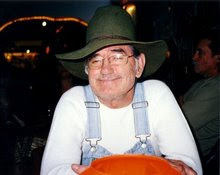 THE OLD cliche of the broken-hearted clown became reality for Pio Nock in May when his wife of 50 years, Alexandra, died. But the show went on, and, even at the age of 77, Nock remained a star, and continued to perform. He died performing before a packed audience at a winter circus in Dortmund, Germany. Towards the end of his number, he fell from his chair into the sawdust and was taken to hospital, where the doctors were unable to resuscitate him. Even as they tried to do so, his granddaughter Nina Cortes continued the performance, hiding her own emotions as she carried out a high-wire act her grandfather had taught her. It was the opening night of the Christmas season and the public could not be disappointed. Nock came from Switzerland, a country that has created many of the finest clowns, including the Chickys, Pic, Dimitri, Andreff, Emil Steinberger, the cabarettist who made a sensational transition into the circus ring, and the television stars Duo Fischbach, as well as the greatest clown of all, Grock (Adrien Wettach, 1880-1959), who retired from the ring at the age of 74. Nock, however, could not bring himself to retire from the life into which he was born. 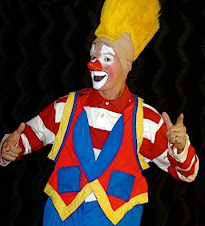 Pio Nock could trace his circus heritage back to 1770, when the dynasty was founded by Jakob Nock. Pio was born into the sixth generation, in Berne in 1921, the second son of Julio Pius and Amanda Nock. His brothers and sisters, Charles, Anneliese, Edith, Lotti, Erika, Eugen and Elizabeth, all became circus performers. Eugen, Charles and Elizabeth starred in London in 1953 at Tom Arnold's Harringay Arena Circus with their death- defying exploits at the top of three 70ft-high swaying poles, before going to America, where they established new branches of the Nock family. The basis of the Nock dynasty's performing artistry lay in their early exploits as itinerant highwire walkers. They gave al fresco open-air displays in the streets and market places of Switzerland, and the tradition of Nock wire-walkers has persisted to the present. 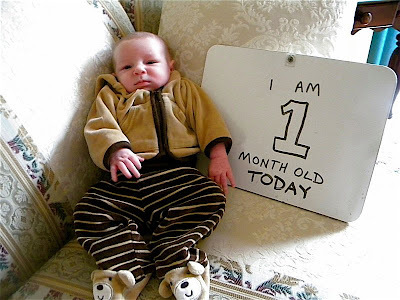 As soon as Pio could walk, he began his training. In 1929, his mother and father founded their own travelling show, Arena Pius Nock, which gave open-air performances, in which all the children eventually took part. Pio's grandmother, Alexandra Josefina Strohschneider was still dancing on the high wire at the age of 74. In 1946, in Lucerne, Nock married Alexandra Buhlmann, a member of another Swiss circus family, and as Pio's youngest sister Erika married Alexandra's brother Moritz Buhlmann, it was natural for Nock to graduate to the Buhlmanns' family show, Circus Pilatus. Moritz Buhlmann was the family daredevil performer, the projectile in the human cannonball act and the show's lion trainer. It was not long before Nock and Buhlmann had devised a new thrill act, with Nock clowning on the high wire while below him sat seven hungry lions waiting for their prey to fall into the cage. His surefootedness, despite his crazy antics, ensured that he never became part of their diet. In 1948, in addition to training horses and ponies, Nock turned his talents to clowning full-time, creating a lovable character who was at first partnered by the white-face clown Angelo and then by Max van Embden, Grock's former partner. He created a classical slapstick and musical clowning act which stood the test of time, and which he performed around the world for 50 years. After the Circus Pilatus closed, Nock and his growing family travelled extensively with leading circuses in Portugal, Spain and France, to Israel and Turkey, Holland, Germany and many other countries, topping the bill wherever he went. For the Christmas season of 1960/61, he came to England for the first time, appearing in the King's Hall, Manchester, with the Belle Vue International Circus in the clown act and, with his wife, in the comedy highwire number performed above Buhlmann's lions. Later he took his son-in-law, Mario Cortes, as his white-face clown and faire-valoir, and members of his family joined him in the highwire act, in which he appeared above the swimming pool in Bournemouth at George Baines's Aqua Show. Three generations of Nocks appeared in Mary Chipperfield's Circus at Pleasureland, Southport, for the summer season of 1989, Pio Nock's last appearance in England. In the 1960s Nock worked in Germany with the Circus Paula Busch and went on to join Germany's huge Circus Franz Althoff. He played a major role in the epic American circus film, The Magnificent Showman, or Circus World as it was known outside Britain. Made by Samuel Bronston in 1964, it starred John Wayne, Claudia Cardinale, Rita Hayworth and Lloyd Nolan, with Nock and Max van Embden in their clown acts. Nock continued to enjoy enormous success in his native land, and was featured by the renowned Swiss National Circus Knie on several occasions. He was in their special programme for Expo 64 in Lausanne and again in Knie's own 50th jubilee programme in 1968. He appeared in America for seven years with "The Greatest Show on Earth", the Ringling Brothers and Barnum and Bailey Circus. During this time, Nock sustained a fall from 10 metres up on the wire. He fell directly into the wild animal cage containing a dozen or more fierce lions and lionesses and it was only thanks to the quick actions of the trainer Wolfgang Holzmair, who herded them swiftly out of the cage and back to their living quarters, that his life was saved. Although he established a second home in Sarasota, Florida, close to the winter home of the Ringling show, he never appeared in America again. He returned to Knie for the 1976 season and was subsequently invited back in 1978 for Knie's 60th jubilee celebrations, and yet again in 1994 for its 75th anniversary. 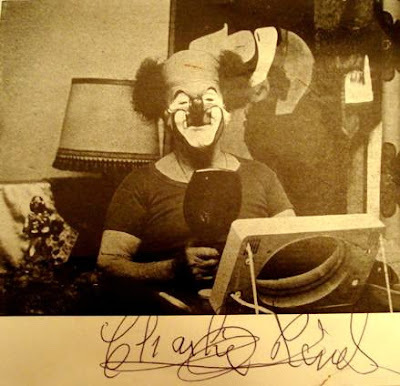 Pius "Pio" Nock, clown and high-wire performer: born Berne, Switzerland 10 November 1921; married 1946 Alexandra Buhl-mann (died 1998; two sons, one daughter); died Dortmund, Germany 4 December 1998. For video of Mr. Nock at Circus Knie in 1964, please click here. "Viva Variety"? Isn't that the copyrighted name of a Comedy Central television series? 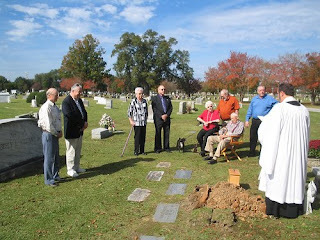 Longtime Clyde Beatty-Cole Bros. circus clown and ringmaster, Jimmy James was laid to rest at the Riverdale Cemetery in Columbus, Georgia on October 29 by his relatives. Fellow Beatty-Cole clown Kenneth Dodd made the arrangements and Father Richard J. Martindale (Rector of Trinity Episcopal Church) officiated. Springfield native Bill Strong performed a double-trapeze act with his wife, Trudy, for close to 20 years at just about every circus this side of Ringling Bros.
Bill Strong died last week at age 75. For 1956, it was an awesome metaphor — the eagle clashing with the bear. For what had to be the longest, scariest 15 minutes of anybody’s life, one lean, high-flying American met the aggressor bear head on to safeguard what we hold most dear in this land of the free. Only when Bill Strong came soaring down out of the sky that day 53 years ago, his act of heroics was never to be recorded in the annals of any war, cold or hot. Mainly because, sometimes, a bear is just a bear. “Former Springfield man is injured in wrestling escaped bear at fair,” the Springfield Daily News reported. Strong, a Springfield native who died on Oct. 18 at age 75, was two years into his professional career as a circus aerialist when, performing at a fair in Cobleskill, N.Y., a 450-pound European bear busted loose on children’s day. Apparently sensing a plentiful food source, it started chasing the kids. Enter the former Springfield Wildcat. Strong only needed 14 stitches in his head. Ironically, though, in a career spent dangling 45 feet in the air without a net, he really only got hurt that one day. Strong’s recent passing means we’re that much closer to losing an entire era of American history for good — another showman gone off to perform three shows a day under that great big top in the sky. But, really, even the tail end of a golden age is still the golden age. “Those were the good times,” Trudy confessed. Married 50 years ago this past June after the 8 o’clock show of the Hamid-Morton Circus in Trenton, N.J. — “And we did three shows the next day” — Mr. and Mrs. Strong eventually partnered as The Pharoahs (sic), a double-trapeze act. The theme was completed by a homemade replica of the Sphinx — “probably the size of a large dog,” Trudy Strong said — they’d stick in the ring as they performed. “We were one of the better acts of the time, I must say,” she said. They perfected their “cradle act” behind Bill’s parents’ house on Shaffer Street in the winter and spring of 1963. They were to debut that season with the Gil Gray Circus. An April 1963 photo in the News showed Bill Strong, hanging upside-down, twirling a perfectly horizontal Trudy by a leather neck strap with one hand. What the paper didn’t say was that Trudy had given birth to their first son just three months before. “I was chubbier than I wanted to be,” she said. It was a different era. Trudy Strong performed a trapeze act until she was 6½ months pregnant. It was a different circus, not yet marginalized by charges of animal cruelty. The Pharoahs performed for 18 years. “It’s hard to believe he could do that when you saw him later on,” Trudy Strong said. Yeah, it was a different era all right. Bill Strong had taken up smoking when he was, no joke, 9. It caught up to him. He developed chronic obstructive pulmonary disease, a fancy way of saying he had a double-whammy of emphysema and bronchitis. His coughing ultimately ended the act. 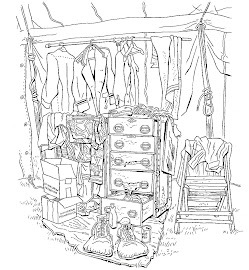 “You can’t cough when I’m hanging by my toes,” Trudy Strong remembers telling him. In accordance with his final wishes, half of Bill Strong’s ashes are to be scattered on a farm near Tremont City they once called Circus Farms. It was as much a farm as circus peanuts are legumes. Owned by Bill and Trudy for almost 20 years, it was a place where show folks could lay off between dates for a day, a night or even a week. It wasn’t uncommon to see elephants in the yard. 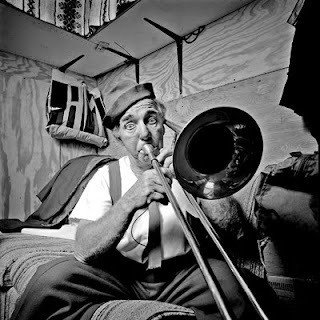 The other half is to be scattered in Gibsonton, Fla., the famed circus town he and Trudy called home in recent years. Trudy left it up to her husband how to divide the ashes. Contact this reporter at (937) 328-0352 or amcginn@coxohio.com. The Grimaldi-era "Hot Dog Machine" as a vaudeville act.